Since 2004, following feedback from solicitors, UPI has provided an exclusive facility to offer unoccupied property insurance. The scheme is underwritten by Ocaso SA. Ocaso was founded in 1920, and has always remained independent of any external financial organisations, providing confidence and peace of mind to millions of people in Spain and overseas. 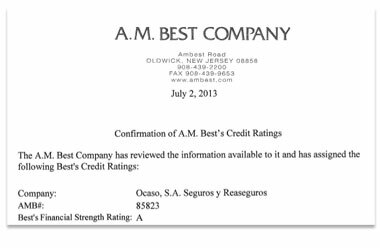 The prestigious firm A. M. Best, which specialises in rating the insurance and reinsurance industry, has confirmed the financial strength rating of A for Ocaso S. A. Seguros y Reaseguros in 2013. In the UK, Ocaso underwrites insurance business through offices in London and Manchester, is a member of the Association of British Insurers and is subject to limited regulation by the Financial Conduct Authority (FCA). Ocaso has been present in the UK market since 1973. The policy is tailored especially for solicitors and executors, catering for unoccupied properties requiring a quick and simple insurance solution. Many home insurance policies do not provide cover for properties which become unoccupied and, if they do, the maximum period would normally be only 30 days. UPI’s scheme covers the unoccupied building for a period of 3 months at a competitive fixed rate of 0.09% (Grade II listed buildings 0.117%), 6 months at 0.135% (Grade II listed buildings 0.18%), 9 months at 0.20% (Grade II listed buildings 0.275%), or 12 months at 0.25% (Grade II listed buildings 0.335%). We are confident that these are extremely competitive terms compared with the very limited number of insurance companies now offering such a policy. Fill in our one-page form to get an immediate online quotation. We have a one-page proposal form, providing you with immediate cover. Confirmation of cover will be sent to you within five working days. Please call us on 01474 355322 should you require further assistance. UPI is a trading style of Enni-Scheme Commercial Insurance Services. Enni-Scheme is authorised and regulated by the Financial Conduct Authority. Our Financial Services Register Number is 306857.